Why have many Dalits in India converted from Hinduism to Buddhism? In recent years, hundreds of thousands of Dalit Hindus - the lowest of the complex Indian society’s structure - have been leaving their faith and converting to Buddhism. There are 150 million Dalits in India, but they are neither seen nor heard. Changing their religion makes them visible. They will hide their roots, give up their name, and change their religion, all in an effort to escape from their caste. India’s Dalits are reconciling their religious conversion by referencing the most prominent Dalit in India and architect of the Indian’s Constitution, Bhim Rao Ambedkar. Six weeks before he died in 1951 Ambedkar said publicly Hinduism would not let Dalits live in dignity so he would convert to Buddhism. Sunita also meets those Dalits who have chosen not to convert, adamant a faithful life in the present will be rewarded by birth into a higher caste in the next. 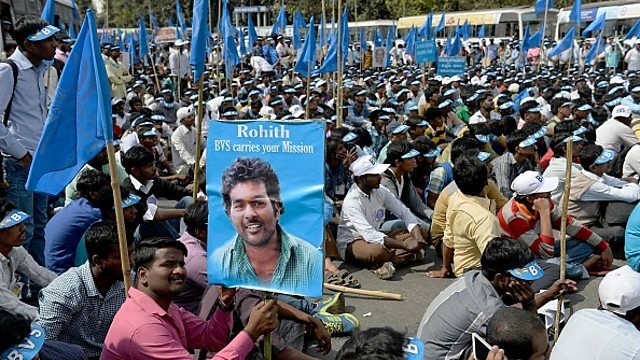 In January a Dalit student, Rohith Vermula killed himself placing the status of Dalits further under the microscope. Sunita meets Rohith’s mother who plans to convert to Buddhism just as her son was in the process of doing when he died.